Who said there is no “i” in Employee Engagement? There are six “e’s” in employee engagement but there is no “i” in employee engagement. This is wrong. I am not playing vowel favorites here but if employee engagement is to ever reach it’s full potential we must firmly place our “I” into engagement. The “I” of personal responsibility, and accountability. 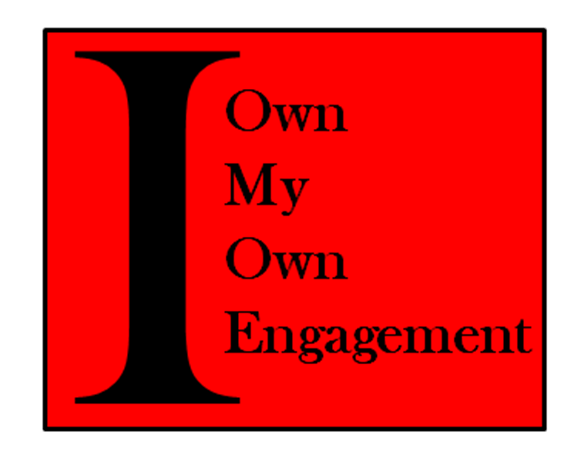 The “I” that declares to the world that I own my own my engagement. I make choices on how I relate to work. The “I” that refuses to be a victim or believes that the organization or other people control our engagement. The “I” that sees engagement as an experience to be lived rather than an organizational problem to be solved. The “I” that steps into engaging conversation when disengagement is being experienced by ourselves or others to see what we can do together to ensure work, works. The “I” that recognizes we influence others’ level of engagement – we refuse to be energy suckers at work. The “I” that will work to make changes in the organization when something or someone is disengaging while also not tolerating a toxic workplace. The “I” that enters fully into work but will exit if necessary to sustain full engagement and personal wellbeing. The “I” that brings our authentic self to what we do and is unwilling to hide behind roles or titles or job descriptions. The “I” that leads through experience, example, enthusiasm, and effort. The “I” that proves that work can make us well rather than merely be a source of stress, drudgery or making money to do other things. The “I” that smiles, connects, nods, and is fully a part of the organization not someone who stands apart from the organization. The “I” that demonstrates caring in all they do. The “I” that is a holographic representation for all the is good, well, and healthy in the organization. Now that I wrote this, I realize I was wrong. There is always an “i” in engagement. That “I” is you, and me.